I stayed up till almost 1am getting things done last night and still woke up without the alarm with the birds around 6am. I only have my laptop with me once a month or so, so I try to catch up on as much as I can while I have it on a zero. All the little things like catching up on email, blog comments (lots lately and I do see them, but can’t always reply), loading videos to my phone for the S Island, Skyping family and friends, researching things for what’s to come, etc. 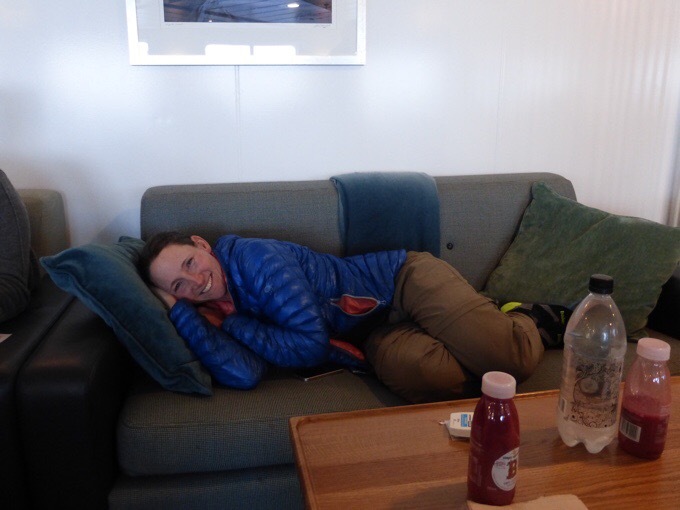 I figured I could sleep on the ferry as we crossed over to the South Island this morning. Timing was pretty perfect as I nailed having my period over the double zero. It has taken me down a notch pretty well, so I’m happy to take this third day in a row of sitting mostly as the transportation back to trail took most of the day today. We had the 8:30am ferry booked (book a couple days early before they sell out!) and Carla dropped us off at 7:45am to check in. We had to check our packs, and didn’t expect that. It was quite frightening to let it out of my sight! I was gifted a spot in the priority lounge by one Carla’s friends (THANK YOU Maggie! ), and it was just right. It is the perfect gift if you have a friend or family member doing the TA and taking the ferry across! Very quiet and roomy with a full warm unlimited breakfast of eggs, bacon, fruit, pancakes, and smoothies buffet, a couch to myself to lay out, premium wifi that was understandably average at best, and a plug to stay charged. They had good monitoring of the food, so my Ziploc plan to bring some breakfast to Becky didn’t come to fruition. I still had some stitching to do on my pants and shoes. Once I finished that, I was ready to conk out, but got myself to walk out to the top deck to see the sights since this is something I may never do again. I got a couple shots looking back at the North Island (of course it cleared to blue skies after I went back down). There was a nice map showing the ferry route that curves out from Wellington Harbour to Picton. 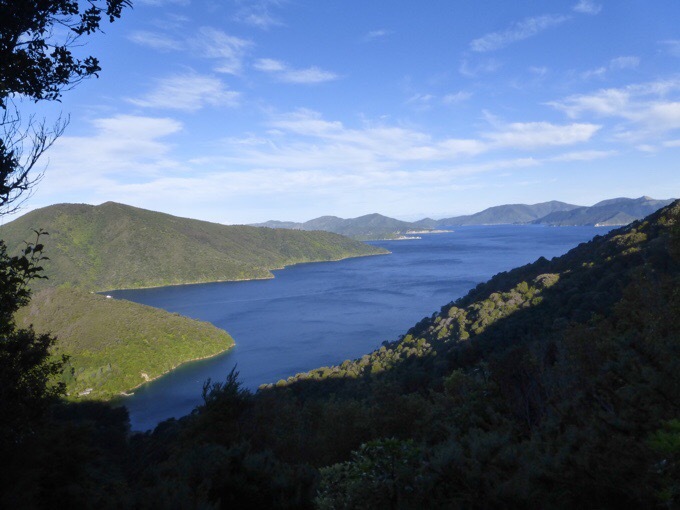 At Picton, we will get a water taxi to go up to Ship Cove to start the Queen Elizabeth Track. 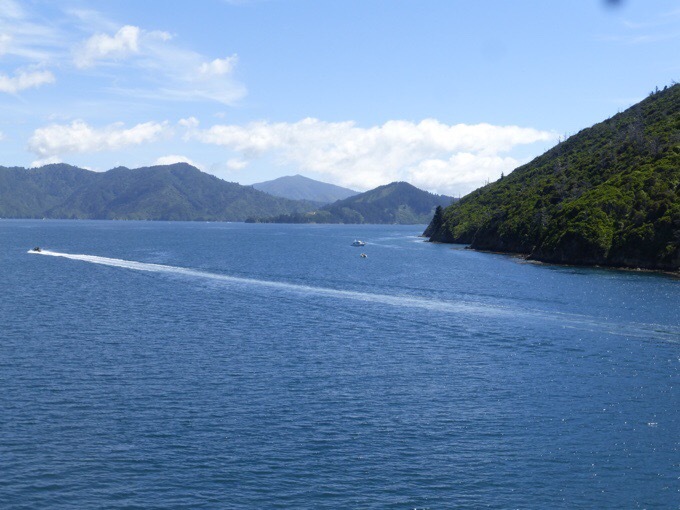 The ferry route from Wellington Harbour to Picton. 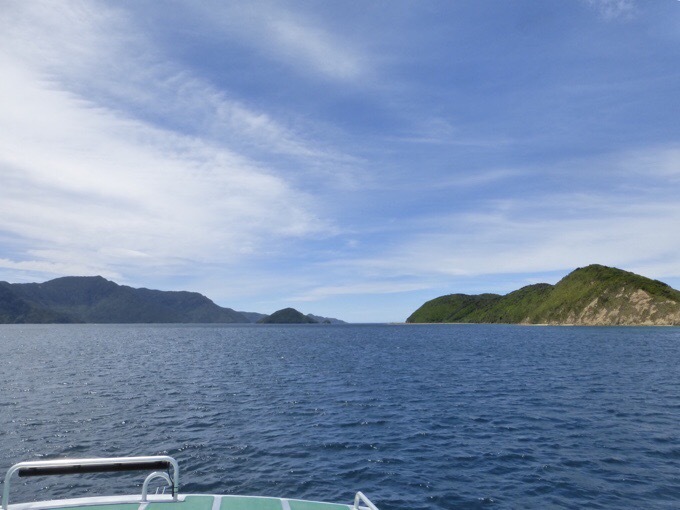 Then we get a water taxi where I’m pointing higher to Ship Cove to start the Queen Charlotte Track. 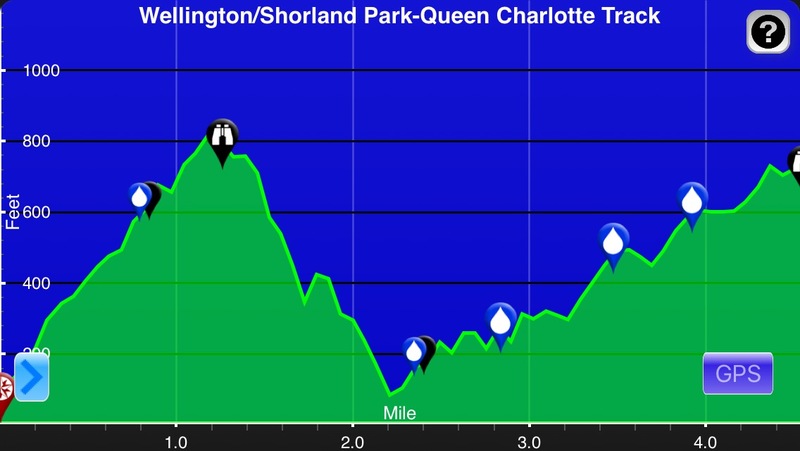 The Queen Charlotte Track will be great! It goes along the coast and on the ridge of the middle island pictured below. It should take two relaxed days and then some road walking the final day to end in Havelock. 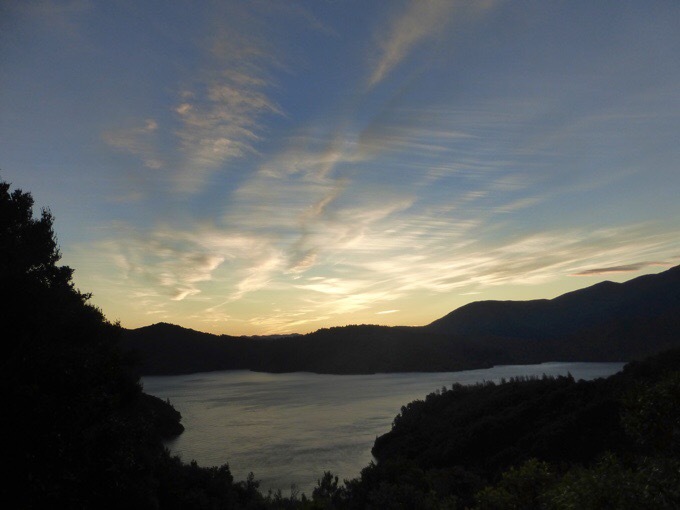 The Queen Charlotte Track right to left from Ship Cove to Havelock. I know we should have taken a photo of the two of us in some over filtered wanderlust shot of the South Island and some inspirational quote, but we were each content to relax, ha! Keepin’ it real. It was too early to muster the wanderlust this morning and I had cramps:/ Here is what you get instead. The fetal position was key this morning. Man, I was a weight today. Apparently, Becky and I get to tag team feeling crappy and it’s my turn. At least I didn’t get sea sick! While lounging, it suddenly hit me I didn’t have my sunglasses. Ah, crap! I had them laying by my pack so I didn’t break them and left them at Carla’s. I only had them for 1.5 days of hiking! That’s the fourth pair I’ll be buying on this hike! Dammit! At least in this case I will get them back in my bounce box in a month, and given the pattern, I may lose the next pair by then. Good news is I’m totally winning this headphones vs sunglasses competition replacement with Becky! So frustrating! Then the morning tea came out just as the ferry approached the South Island that included a variety of unlimited cute sandwich rolls (like sushi), brownies, scones, and some actual sushi. Some of this conveniently fits in a Ziploc if anyone is wondering…Becky found a great spot to sit at the back with a glass viewing deck and was a happy traveler. 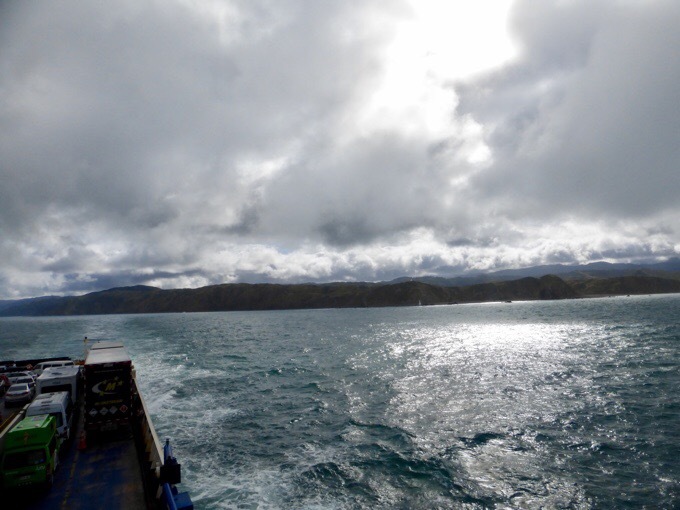 The ferry ride arrived in Picton at 11:45am and cost $61NZ/$48US. Then we got a TA hiker deal with the water taxi to Ship Cove. It’s a $50NZ/$37US one that leaves at 1:30pm and takes about an hour longer than the $75NZ/$56US one because it delivers the mail. We wanted to save the money and figured saving $25NZ/$19 for an hour difference was worth it. 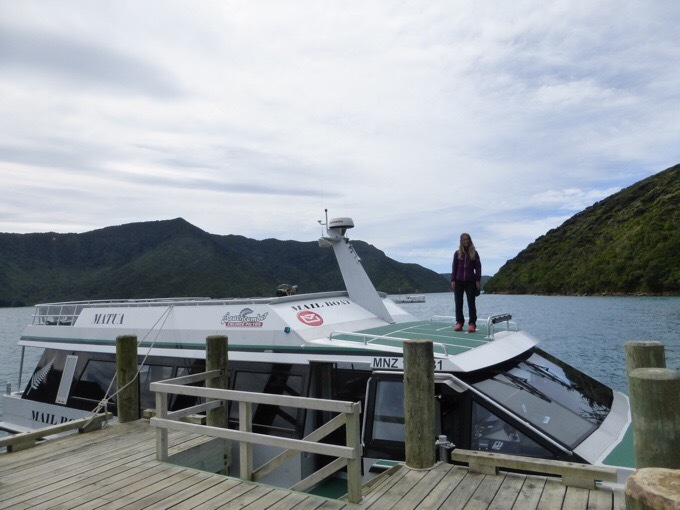 During the 1.5hr layover of the two boats, we went to the Picton iSite and bought our $18NZ/$13US passes for the Queen Charlotte Track. 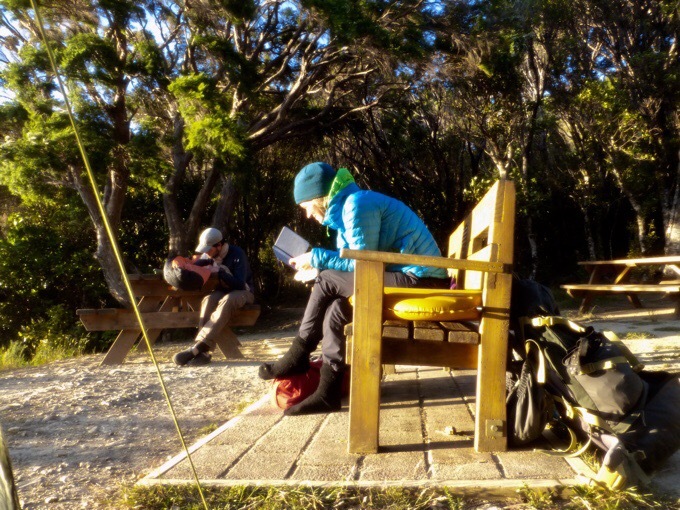 Then I inquired about the logistics for doing the Abel Tasman walk, which is one of New Zealand’s Great Walks, but not part of the TA. There are additional side trips I’ve had my eye on to do along the way, and the Abel Tasman (37mi/60km) was a major one. 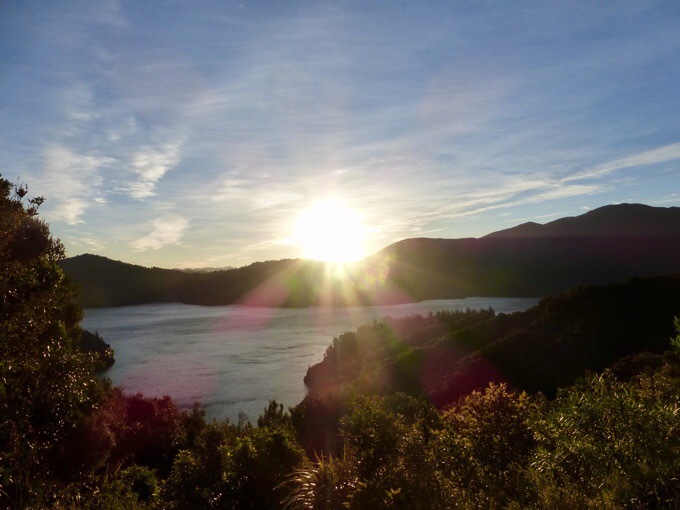 Since it’s one of New Zealand’s 9 Great Walks, it is quite popular, and the campsites tend to be booked solid because it is the beginning of summer tourist season. Well, I got super lucky and was able to find a way to make it happen! 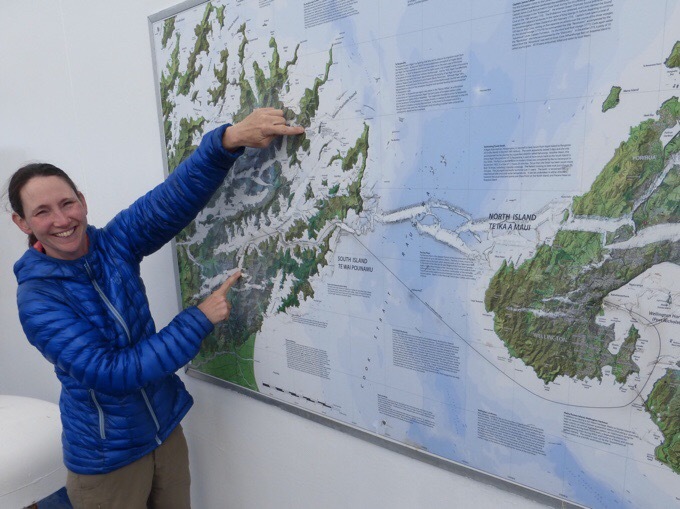 The dates worked out to fit it in right after the Queen Charlotte Track and before the next leg in the challenging Richmond Range. It will require some pushing to fit it all in, but I’m really excited that it’s even possible. There’s even a section that requires a low tide at the right time, and the timing is just right for when I’ll be scheduled to go through. With the price for the campsites and a water taxi at the end, it was $75NZ/$56US. Yep, expensive compared to many other short hikes, but it is popular and I feel like I should do it while I’m here. Pretty excited that it’s going to fit in so perfectly as a side trip. 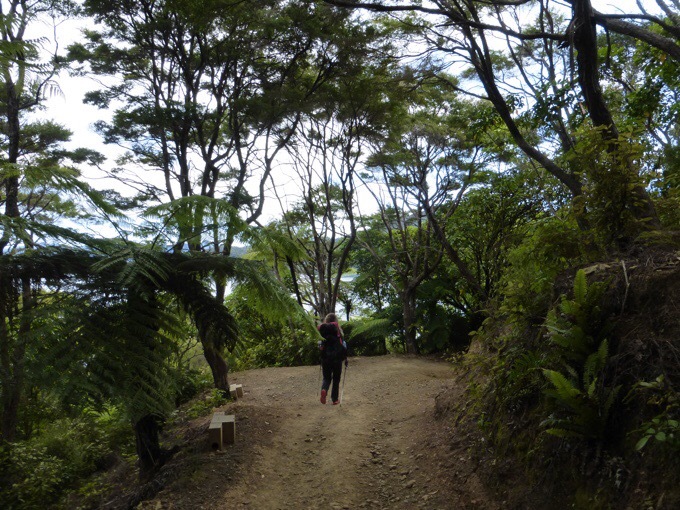 I’ve been open about wanting to do the Abel Tasman all hike, so this wasn’t a surprise for Becky. She was a maybe, but it will be a tiring push (and extra $$) before a major leg through the Richmond Range. Plus, she plans to live here for a full year like many young people who were granted the 12 month working visa. Her plan is to hit many of the side trips and tourist things during those months after the TA that she’ll be living in NZ. She has a friend coming the last month of her visa and they are eyeing doing the Abel Tasman then. This gives Becky the perfect opportunity to do the Queen Charlotte at a really relaxed pace and then take a zero to meet me in Havelock. Just the rest she needs before the Richmond Range. Also, we’ve been planning that this will also allow Tom, who we last saw in Whanganui (when he went home to Auckland to spend Christmas with his family) to catch up to us. The three of us really like each other’s company, and he’s a great energy to be around. He’s been in touch ever since we separated on Christmas Eve, and has pushed knowing we would double zero and then hopefully take time to do the Abel Tasman. It seems that we all three will be able to reunite in Havelock and head out to the Richmond Range together just as we hoped, yay! Plus, weather is even in our favor for the upcoming week and it seems summer might really be here. Just great timing and a perfect fit for all three of us. Ok, so back to today. 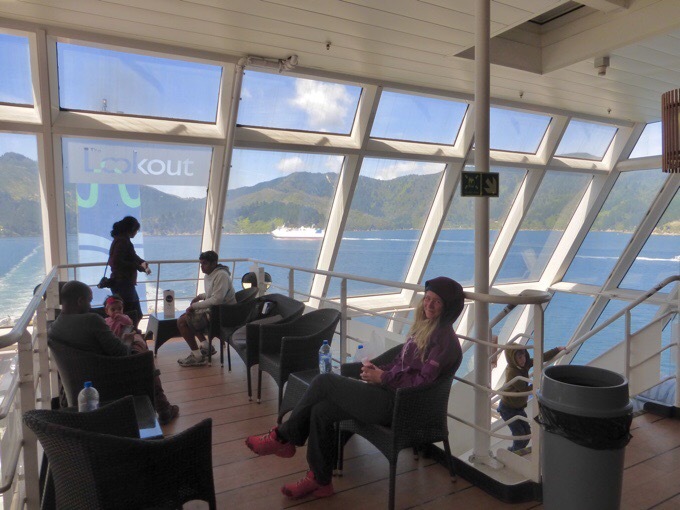 When we found out I was doing the Abel Tasman, Becky had an extra 20mins to run into the grocery store and grab extra food to take more days to do a relaxing version of the Queen Charlotte. Today was not my day as I left all my refrigerated things for this leg in Carla’s fridge this morning. Becky returned from shopping with her additional food, and thoughtfully bought me new cheese, spinach, and chocolate milk to replace what I left behind, aww! Then we took the 1:30pm water taxi with Beachcomber Cruises and sat up top outside to take in the views. It was a great day for it! 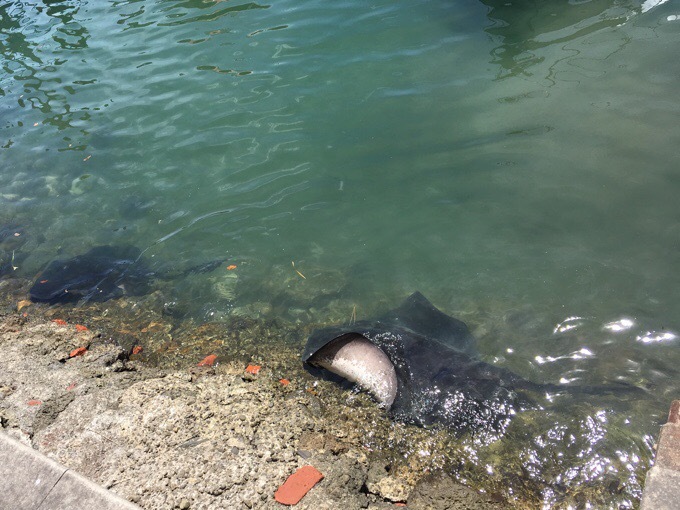 Some sting rays in the water along the shore. 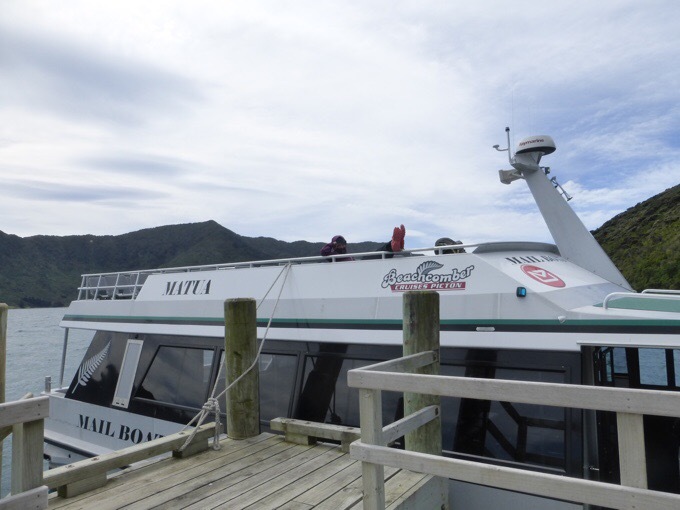 The water taxi made a couple stops along the way including Motuara Island, a bird sanctuary and short hike up to a viewpoint. It was a 40min stop, and I was pretty wiped out, so I chose to each lunch on the stable dock instead of hiking. Becky also wasn’t in the mood to do a bonus hike today and lounged with her feet up on the top deck. Just a few minutes after taking that photo, I looked up to see Becky, standing on top of the boat having climbed over to where people aren’t supposed to go, staring at me waiting for me to see what she did as if to say, “I know I shouldn’t be up here mom, but how could I resist! ?” Notice how she also needs to stand right on the edge as close as she can get while the boat bobs up and down with waves. Yep, the feisty playful Becky is back and testing those boundaries. Kids! 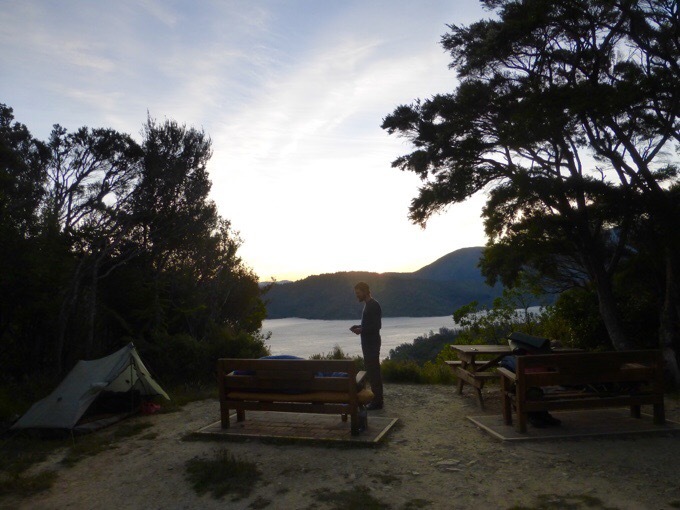 We finally got to Ship Cove and the start of the Queen Charlotte Track at 3:45pm. There was one other TA walker (Christophe from France) also on the water taxi, and the three of us ended up walking a short distance in together to a viewpoint and spot to camp. 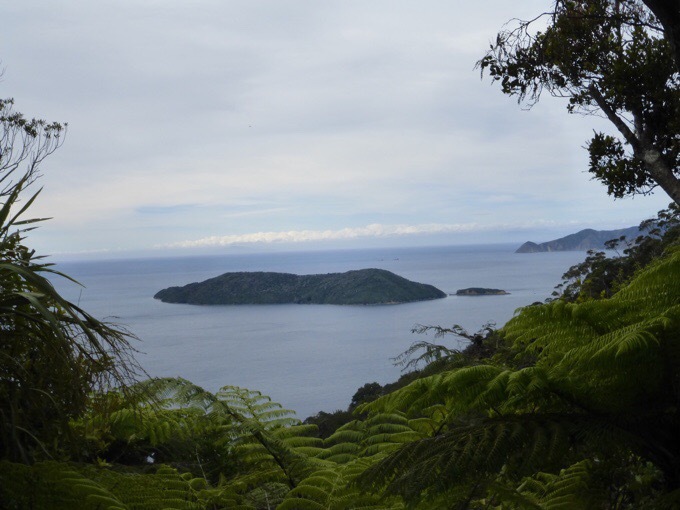 Motuara Island where the bird sanctuary is. The track was really wide and well maintained. There were tons of traps lining the trail to catch various rodents. We are accustomed to seeing these traps, but there were a ton of them along the track. 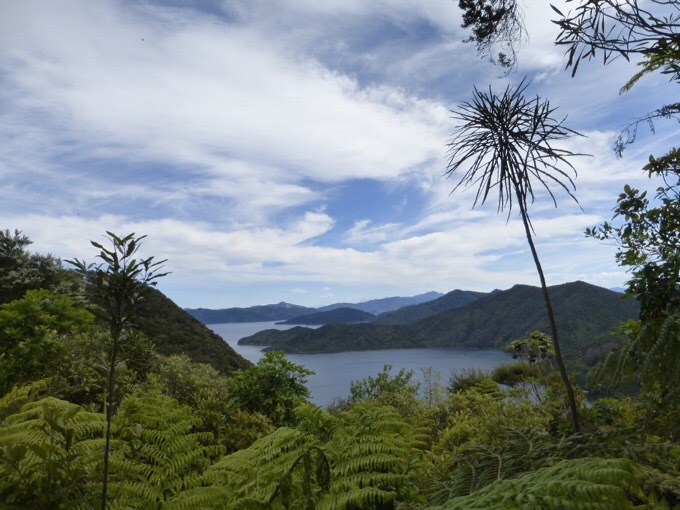 The Queen Charlotte Track goes along the ridge on the right. We stopped just before 6pm at a nice spot to camp with picnic tables, a toilet, and a nice view. Becky and Christophe decided to try cowboy camping (camp without the tent) on the bench and picnic table, and I was happy to pitch my tent. Becky was excited to give it a try as she had never cowboy camped before and this was a rare opportunity on the TA that often has mud and condensation. It was super calm when we got there, so I looked up the overnight weather. It said winds would pick up and then die down overnight. Oh man did it pick up. It was the windiest night we’ve had at any camp so far. It was really laughable how windy it got. At least there weren’t any sand flies! It was a relaxing night, and Becky journaled in her new journal she bought in town. I’m a big proponent of people journaling along the trail in some form. It can be easy to get caught up in the daily grind of things and lose perspective of how lucky we are to be thru-hiking. The journaling is great for looking back on the day, and I find that it helps me to value it a lot more. I’m super excited to see Becky journaling! After tonight, we will be separating for the next five days until we meet again in Havelock. Don’t worry, this isn’t permanent. 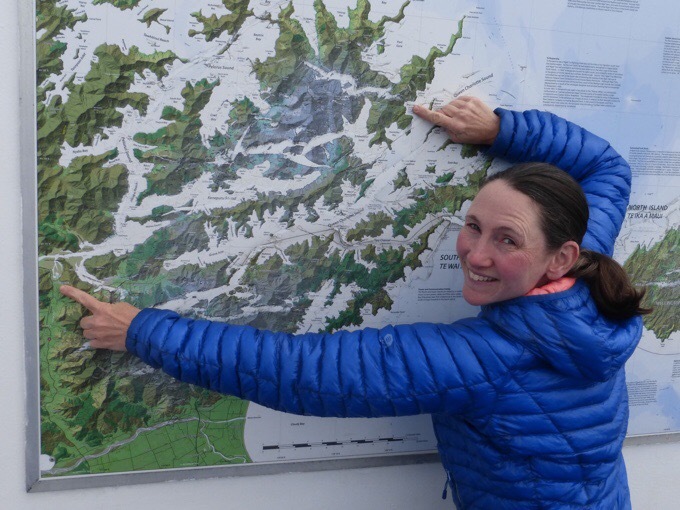 I’ll push ahead to do bigger days, and then hitch to the Abel Tasman while Becky will take relaxed days to do the Queen Charlotte and then will zero to be well rested before we take on the Richmond Range. 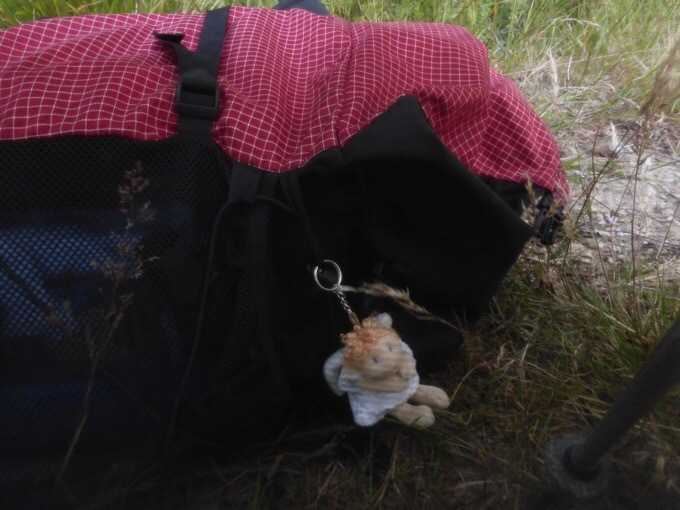 She now has a guardian angel sent over from her family attached to her pack, so she’s well protected:) This photo is through the vestibule of my tent where Becky put her pack overnight. Becky’s guardian angel from her family. Whew, what a long day that had very little hiking in it. Don’t worry, there’s plenty of hiking and good weather ahead! Tomorrow, the solo stretch begins. 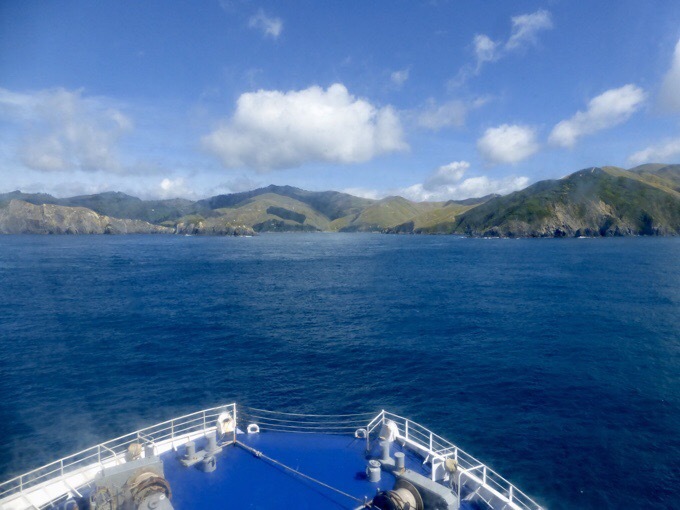 Interested to see Ship Cove – it looks wonderful – Captain Cook loved it by the way – he went back to resupply there on each of his Pacific explorations. 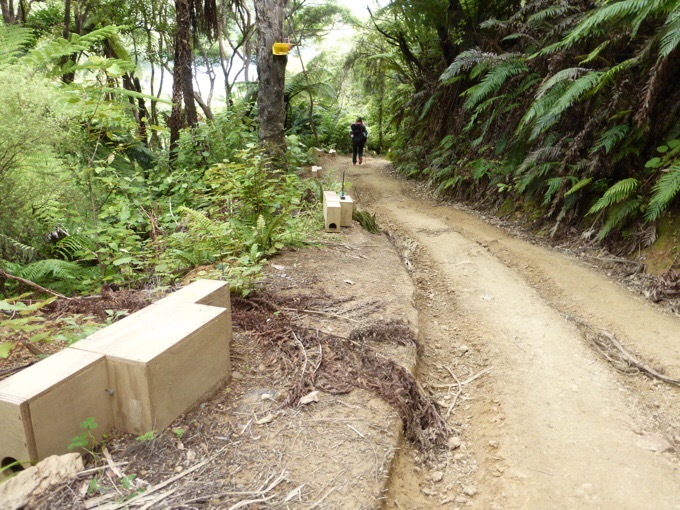 You’ll LOVE the Abel Tasman Trail. Erin its possible Becky’s illness was either caused by her picking up the hedgehog (Biological Weapon) on day 34. 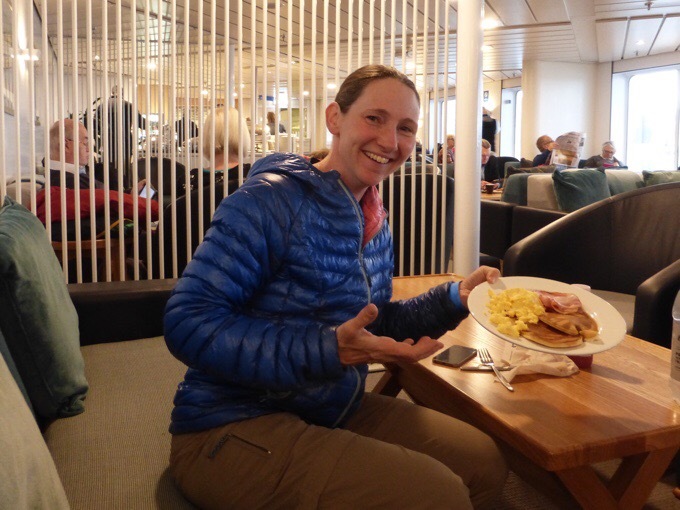 What’s it with hiker’s and plates of food?!! Sounds like you had a great day. And the view photos are pretty awesome. Very excited and curious about following along for the South Island. Interested in seeing the contrast from the North Island! In awe of your management of the complicated logistics, as always .. have fun on the South Island! Thank you for the links. I might have known that we humans are once again trying to solve problems we created ourselves! Enjoy the Abel Tasman. I can’t wait to see your photos to bring back my memories. Will be fun to follow you solo for a few days.. and just think! If you should leave anything behind, Becky may notice and bring it along. Kind of like she is ?swimming the anchor leg.. more like running last leg of a relay. Warren, I enjoy your comments as well. I definitely thought that as well!